The outcry was immediate, not only from the mayor of Boston and survivors of the bombing, but also communications scholars who criticized the choice of cover as not only insensitive, but misleading. How could the editors have depicted a killer in such a way, especially to the youth who read the magazine? 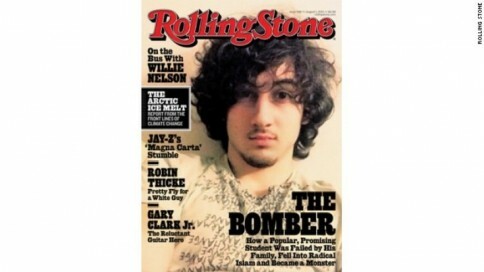 Boston-area residents in particular complained that the cover made the young man look like a rock star. It didn’t seem to matter that the same photo had already appeared widely in the media, including the front page of the New York Times. Janet Reitman’s piece helps the reader understand how someone who seemed to fit in so well and seemed so “normal” could end up committing such terrible violence, as good investigative journalism is supposed to do. Much was made of the (mostly female) fan club that has developed to support the accused and to profess his innocence. Many interviewed in the story speak of how the young man was “gorgeous” or “cute.” Critics argue that the choice of cover only reinforces this perception. Three similarly pejorative words that have entered the English language are “thug,” “assassin” and “zealot.” All three derive from the names and practices of historical religious terrorist groups: Hindu, Muslim and Jewish respectively. When someone uses threat and violence as a communicative tool to achieve things that we agree with or think they deserve, then we refuse to apply the label “terrorist” because of the negative connotations associated with the word. That is why one person’s terrorist is another person’s freedom fighter. For many years, I taught a university course on biological and psychological theories of crime. In this course, I asked students to do a photo project in which they had to make a photograph of themselves as a criminal and as a non-criminal, using theories from the course. They were also asked to provide a “baseline photo” of themselves before their experiment. Some students simply used that same photo as their “non-criminal photo,” suggesting that their self-image was intimately tied in with the idea that they could never possibly be a criminal. Janet Reitman’s piece in Rolling Stone helps the reader understand how someone who seemed to fit in so well and seemed so “normal” could end up committing such terrible violence. This is what good investigative journalism and good social science research is supposed to do. The widespread anger and revulsion at the Rolling Stone cover is a reflection of how much this professional norm has been and continues to be undermined, especially since the 9/11 attacks. One commentator describes it as a culture of denial, self-censorship and basically w88ประเทศไทยjust not wanting to know. Prime Minister Stephen Harper’s remark after the Boston Marathon bombing that it was not the time for “doing sociology” reflects the same anti-knowledge trend. In this atmosphere of denial and accusation, explaining is considered the same as justifying. From this perspective, any attempt to understand what really happened risks opening the door to sympathizing with the perpetrator. Sympathy or understanding is simply not acceptable in a Manichaean world of us vs. them. One can only hope that people of all ages and backgrounds read the entire Rolling Stone article and come to their own informed conclusions. Copyright (c) 2013. Ronald Crelinsten. Reprinted with the permission of Ronald Crelinsten. Dr Ronald Crelinsten is Associate Fellow at the Centre for Global Studies at University of Victoria and Adjunct Professor in the Doctor of Social Sciences Program in the Faculty of Social and Applied Sciences at Royal Roads University. His research and publications deal with terrorism and radicalization and how to counter them effectively without endangering democratic principles; global security; gross human rights violations; the role of old and new media in terrorism and political violence; challenges of democratization and global governance. His publications include: Counterterrorism (Polity Press, 2009; Arabic version: UAE, 2011), The Politics of Pain: Torturers and Their Masters (Westview Press, 1995), Western Responses to Terrorism (Frank Cass, 1993), Hostage-Taking (Lexington Books, 1979), and Terrorism and Criminal Justice (Lexington Books, 1978). He was also Visiting Professor at the Middle East Technical University in Ankara,Turkey.